Confession: I'm one of those people who snicker or smirk when certain words are pronounced differently from how I've been raised to say them. Examples: Coupon. Caramel. Mayonnaise. Pajamas. Scallops. Worcestershire. And a common one--pecan*. *For the record, I personally say pah-cahn, with the emphasis on the second syllable. For the record, all three are correct. It's taken me awhile to fully appreciate the pecan and all its many applications. While you still won't see me reaching for a handful of plain ol' pecans, all you have to do is salt 'em and toast 'em or toss them with caramel (that's with three syllables, if you please) and I'm excited. My most recent use for the lovely nuts was a unique case. I often bookmark recipes that I see on other blogs, but rarely do I make them the next day. 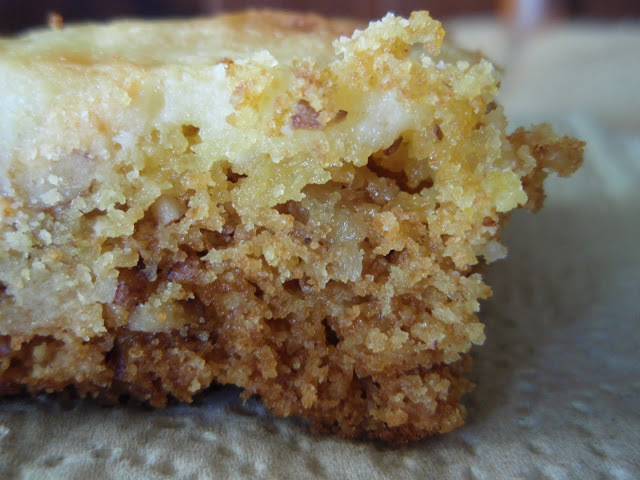 When I saw Karly's post featuring her twist on the gooey butter cake, I didn't waste a second. All I had on hand was a lemon cake mix, but it worked out quite nicely. For obvious reasons, a butter cake mix would be better. Regardless, if you like both pecans and the traditional version of gooey butter cake (and honestly, how could you not? ), this dessert is for you. The nuts in the bottom layer make it blissfully crunchy and rich. Yes, even more rich than the original. Paula Deen would be proud. Say, what other words get pronounced differently depending on the region? In a large mixing bowl, combine the cake mix, 1 egg, melted butter, and pecans. Mix well and press into a greased 9×13-inch pan. Cream together the cream cheese, 2 remaining eggs, and powdered sugar until well combined. Pour over the crust. Personally I don't want to eat anything that has a PEE can in it, I'm pah-cahn all the way. And just for reference I'm from GA. I would be oh so happy to have some of that butter cake for breakfast this morning. YUM!! What a lovely, ooey-gooey cake. As always, beautiful. "gooey" & "pecan" are two of my favorite words! ;-P Gorgeous bars. Way to make Paula proud! I could enjoy pecans in just about any application, but a gooey, rich bar sounds pretty irresistible. I'm a pah-cahn girl as well--and I think I would love this cake! 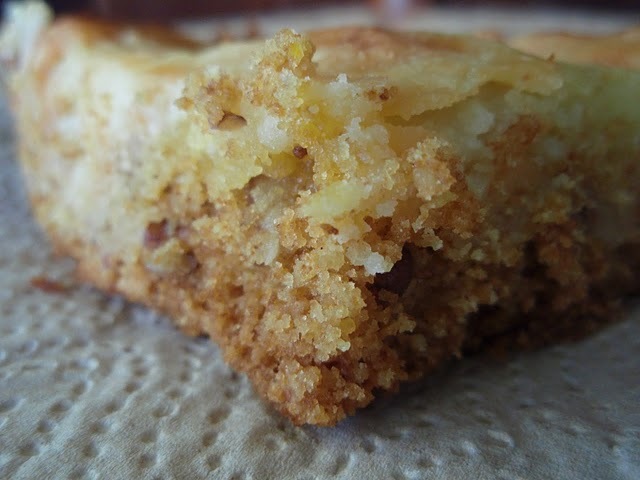 Can you believe I've never had Paula Deen's gooey butter cake? You're tempting me now! No pees here. It's pah-cahn! And if Paula says olive erl one more time, I'll scream. Anyway....this looks like a super cake, Grace. I've never made her cake either...but I like your version! We'd agree that these bars look pretty darn good though! I think I say it the same as you...sounds delish it a gooey cake like no matter how you say it! Hey, I pronounce pecan and caramel the same as you. Let's be friends ;p. This looks ooey gooey absolutely irresistible. I can see why you made it so quickly. I grew up in the SF Bay Area and pronounce just like you do. That cake looks amazing and I bet it tastes even better. Enjoyed your post! I'll be the odd man out here and call it a pea-can. (But I'll say it with my pinky extended. )However you say it, this looks yummy! No matter how you pronounce it, that recipe looks great! I'm in your camp, by the way. YUMMMM. You have no idea how excited I am by these bars. They look delicious! I say puhcahn. Hate PEEcan. I'm a PEE-cahner. Most people I know in this area are, too. And you know SOME people in this country say dahn instead of dawn, dahg instead of dog, and so forth. And to finish I'll say that this recipe is so definitely bookmarked. This looks really really good! I don't care how anyone pronounces it, I just want a piece! Down under we pretty much all say Pee-can unfortunately. I love this pah-cahn version. I wish I said pee-can. I've always liked it better but can't make my brain start saying it that way. Yummy looking gooey cake and love all those pah cahns Grace...I say caramel like you too! I've never made Paula's cake, although I do have it bookmarked. I like your version with the lemon cake. As always, very temping pictures! you crack me up! I love them pee-cahns; love to pick them myself too and roast them and your cake looks lovely! Just lovely Grace. I love pee-cans (as us aussies pronounce it) in any form, and the first time I heard it pronounced pah-cahn, I thought they'd said it wrong. (How self confident am I then?). Butter cake, lemon cake, it's all good. As Shaz said - pee-cans for we Aussies. This sounds so easy! And anything with cream cheese in it gets my vote. Brilliant, as always. I've been so curious about this gooey butter cake. Have you ever had it? You've just improved that cake! gooey and pecan go perfect together...I love pecans!! Delicious! What else can I say? BTW, I always have a hell of a time with "Worcestershire". When you lived in Albany, did you ever drive along Route 84 going into Connecticut? There's a place there called Lake Carmel, which I always told my girls was filled with caramels. But I never took them there, because I said it would be very bad for my derriere. And, "Worcestershire" is "Woostershire". Just like "Worcester, Mass." is "Wooster, Mass." It's such a pesky name! That said, I'd enjoy your "pah-cahn" bars! Excuse me while I wipe the drool off of my chin. Pecans (pah cahns) are my favorite nut and I am always looking for new recipes using them. All i have to say is YUM! I am saving this recipe. This looks delicious! I'm from Ohio originally, and most pronounced aunt as "ant." Anything else would drive me crazy! I love pecans and these bars look so so good! I live in pea-can county and I'm huge a pah-chan lover (and pronouncer) however you pronounce it these bars look great! anyway, this cake of yours looks really delicious. i could eat a pecan any time! Holy Poo, I cannnot wait to make this. I have everything but the cream cheese! Thanks for sharing! Coffee is a fun one. Or maybe I just feel that way because I grew up surrounded by NY accents. My parents totally say CAWFEE. I love pecans no matter how you say them...they have this subtle sweetness to them. This cake sounds fantastic! There are just some recipes you simply must make right away. Immediately, do not pass go! And how about sherbet. I actually say shure-bit. Not shure-bert. Where exactly did the r come from. Everyone does it though. Out west it's pee-cahn. But I could be convinced to call them something else if it results in a slice of this cake. well, I am always told that I say it incorrectly. I say "pee-cahn", which many think is the American way of saying it (here is Australian most people say "pee-can"). Either way :) i do adore the delicious nut! My fiance says numerous things differently to me, which I always find entertaining. "FRUIT salad" - emphasis on the word fruit, not salad. & "tiraMIsu", whereas i say "tiramiSU". the bars look really yummy too! Grace...those nuts will be devoured by me in a peee-can ;o) pie any time of the week. Did you get that sweet tooth weakness of mine? Now, about that decadent cake...especially as a quick fix me up delight...sounds pretty tempting indeed! Yum! I am a fan of the pecan as well. I say: pe-cahn. what, no cinnamon for the nuts? Sounds delicious, I just love crunchy rich and gooey! Looks amazing. Cannot wait to try it. OK, you have got me on the mayonnaise. I have only heard one way to say it! I am so sheltered. I like to pronounce words the way they are pronounced in their typical locale, which makes me a bit odd at home. Himalayas is Himawlyas, scallops is scawllops and pecans is pacahns with emphasis on the second syllable! Having unloaded all that on you, this is a wonderful recipe. Can't wait to use some of my pecans. It doesn't matter how you call pecans , it is how u use them, that's important! You made a stunning tasty appetizing pecan butter cake!! I say it the last way you've written it. I love them, mmmmmm! I had to sit there a minute and go through each "example" and figure out the different ways to pronounce them :) This sounds delish and I may have to make it for my Bodega vacation weekend! Any way you say it this recipe sounds good! I looove nuts! This looks so incredibly delicious and moist! I'm the same way -I won't eat pecans on their own, but throw them into something like this and I'll eat the whole pan! Me too... pecans have slowly grown to be a favored baking ingredient. And I know what you mean, as a silent snickerer from when I lived in Texas where they said "pee-can". Anyway, this looks fantastic! Your cakes always look so moist and flavorful. Nothing wrong with pecans and butter! Interesting combo with the lemon...something I would've never considered. It certainly opens lots of flavour-doors! Grace - you are the queen of the sweet tooth! This looks so scrummy and sugary - I wish pillows could be made of this! My ex-husbands Grandmother always said "a Pee-can was what we keep next to our beds at night, a pah-cahn is what you eat". While we are all from Ga my 97yo great-great aunt says pee-can and I smile every time she says it. I found your blog by googling pe-cahn not pe-can! And I'm referencing you on a future post! Do you get pingbacks form wordpress? I'll come back and let you know when it publishes! @PurpleSlob InRecovery: Please do let me know--I'm curious about what you might be referencing!